Dubai: Historical favourites New Zealand and Australia hope to be in the mix alongside defending champions South Africa as the men’s competition for the 2018 Emirates Airline Dubai Rugby Sevens kicks off at The Sevens stadium on Friday. As defending champions South Africa head Group A along with Argentina, Samoa and Zimbabwe, while Fiji, Kenya, Scotland and France are in Group B. Group C consists of multiple world champions New Zealand, alongside USA, Spain and Wales, while Australia headline Group D along with former champions England, Canada and Japan. Action will get under way at 9am on Friday with USA taking on Spain in their Pool C encounter after which former six-time Dubai champions New Zealand will be up against Wales at 9.22am. The opening round of the World Sevens Series holds far more significance to all teams, especially for multiple champions New Zealand, as they chase one of four qualifying spots on offer for the Tokyo Olympic Games at the end of the season. Australian head coach Tim Walsh, a former Sevens player and coach who led the women’s team to a gold medal at the 2016 Rio Games, is well aware of what can be expected as the new season gets under way. “The entire competition is going to be at a total different level this year due to the Olympic qualifying. There’s going to be a lot more hunger and every team is going to be stepping it up. We are no different this time as we are in a good physical and mental state,” Walsh told Gulf News. “I think we have prepared well and the idea now is to just go out there and give it all we have. With all the experience I have, this one is not a sprint, but it’s going to be a marathon where every point is going to count in the end and only the most consistent teams will succeed,” the 39-year-old added. a new World Series, one can see that all teams are pretty keen to get out there and start playing some rugby,” Curry noted. “This year is about qualifying for the Olympics, it’s a massive year for all the teams. You can’t start slow on the World Series. To win a World Series is all about consistency, so it’s important to start well here,” he added. Dubai are hosting both the men and women’s HSBC World Rugby Sevens Series, acting as the men’s series opener and Round Two of the women’s series. 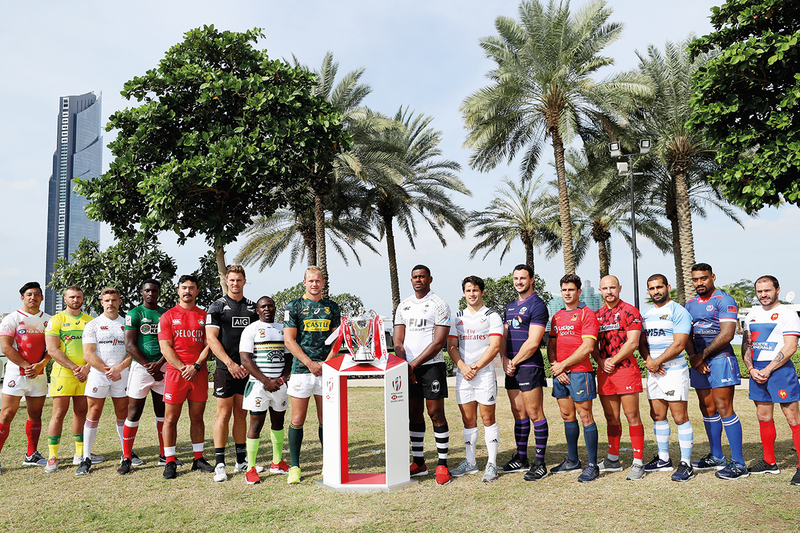 Dubai Rugby Sevens partner HSBC has brought together two former rugby rivals to launch a timetable of inspiring coaching clinics in the Sevens fan village aimed at accelerating the development of young rugby talent in the UAE. Fifteen lucky schoolchildren were thrilled to find former Irish centre Brian O’Driscoll and South African speedster Bryan Habana waiting for them on the pop-up pitch, with the two legends joining local coaches to sprinkle their rugby wisdom on the rookie youngsters, in the first of 11 high-paced, energetic coaching clinics to run across the weekend. In a year where rugby has been added to the national curriculum in the UAE, the coaching clinics form part of the banks continued efforts to support the growth of rugby in the Middle East, with children aged 8-16 able to sign up for the introductory rugby tasters at any point during the weekend.